Lab suppliers working to sell lab equipment in Philadelphia may want to learn more about life science marketing at Biotechnology Calendar, Inc.’s University of Pennsylvania life science events. The University of Pennsylvania is a well-funded research institution, and the events we organize on campus every year attract hundreds of researchers, lab managers and purchasing agents. Our life science events are the perfect opportunity for lab suppliers to get the word out on their newest products and services. 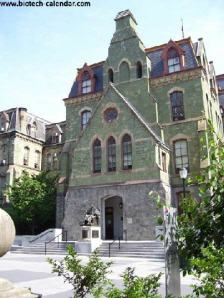 In 2012, the NIH awarded the University of Pennsylvania $457.5 million in life science funding. This money was given out to various departments at the university. For the convenience of our readers, we have put together a list of some of the best funded life science departments receiving NIH funding. A full list of departments receiving funding can be found at the NIH website. Selling lab equipment at the University of Pennsylvania has never been easier with Biotechnology Calendar, Inc. life science events. We can help you customize a life science marketing program at our events with our Fall Special and Sponsorship Packages. Some of the marketing options available to lab suppliers include online marketing, pre-show advertising, competitive placement in event programs, seminar space, and distribution rights to event bags. We also make our leads lists with the double-checked contact information for attendees available after each event. Lab suppliers should also take into consideration that the University of Pennsylvania received $32 million in funding from the NSF in 2012. The life science projects receiving funding varied across such disciplines as physiology and structural systems, molecular biophysics, genetic mechanisms, and systems and synthetic biology. More NSF funding information is available at the NSF website. If you are a lab supplier working to sell lab equipment and engage in best life science marketing practices, Biotechnology Calendar, Inc. invites you to attend our Philadelphia BioResearch Product Faire™ Event at the University of Pennsylvania campus on May 14th, 2014. Our Philadelphia BioResearch Product Faire™ Event consistently attracts hundreds of attendees, including funded researchers, lab managers and purchasing agents. Biotechnology Calendar, Inc. is a full-service science research marketing and events-planning company that has been organizing life science events at top research institutions across the country for 20 years. If you are interested in selling your lab equipment at other universities, we encourage you to view our 2014 calendar of life science events. For more funding information on the University of Pennsylvania, or to learn more about our Philadelphia BioResearch Product Faire™ Event, click on the button below.